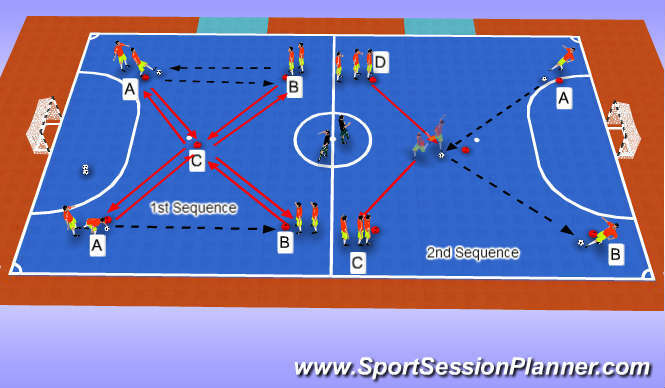 Set Up: 5 Cones in each half as per diagram, Players divide themselves at each corner facing each other. 2 balls at opposite side. Objective: 1st Sequence Line A plays a pass into B, B must receive with sole, roll out and return pass to the players in line A. After you complete your pass you make a run to C and return back to your original line. Objective: Player from line 1 runs into the middle to recieve a pass from A and returns back with a sole role or direct pass. Player in line A receives with an alligator trap 1st touch and plays pass to player B. B and 2 repeat the same sequence. 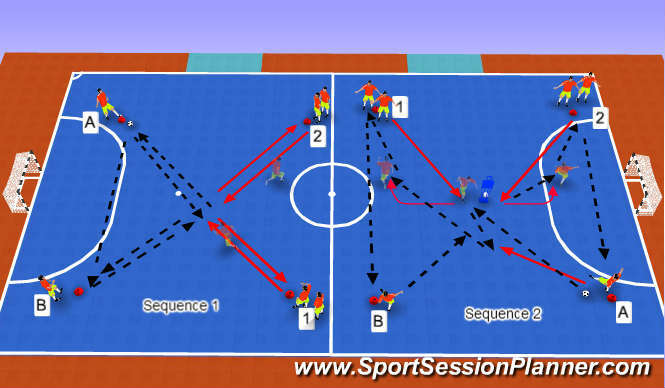 Sequence 2: Player 1 moves into the middle to show on the shoulder of the mannequin to receive a pass from A, A plays into 1 and follows for a short lay off, to play back into the curled attacking run of 1. Ensure that they lay off is a sole role alligator reception. 1 recieves the penetrating pass and plays it into line 1 who plays a long pass down to B. B now makes the same passing sequence with line 2. Coaching Points- Quality of and weight of pass, Reception from receiving player to be with the sole of the foot, explosion of movement once the pass is made. Body and angle to receive the through ball (Curled run) Body stance and how the player spins off the mannequin.